We are delighted to announce our partnership with Canton. For Canton, tea should be both mesmerising and surprising, romantic even, whilst never compromising on the ethical means of its sourcing. Since 2007, Jennifer, along with her business partner Edgar Thoemmes and their team, remain fastidious in promoting positive, ethical practice in the tea trade and hold education and sustainability at the heart of their business. Canton buys fresh tea each season, directly from small, traditional tea gardens in some of the most remote parts of the world where tea bushes have grown for hundreds of years. They know the provenance of every leaf in their range and have established close relationships with the farmers to make sure each and every leaf used in their teas is handpicked and then handcrafted with the highest level of care. In light of this new partnership, The Wolseley team have received thorough training from Canton’s experts to ensure every pot of tea you enjoy in the restaurant tastes exactly as it should. But there are other factors to consider, too… As Canton say, “If you want to give your customers an exceptional tea experience, you start with good tea, but it goes much further than that.” We spoke with Ali Evans, their Head of Tea, about what’s involved in ensuring our team get the very best from the tea leaves each and every time. The Wolseley has recently installed new multi-temperature boilers to ensure every pot of loose leaf tea is brewed at its ideal temperature. Each type of tea has its own ideal infusion temperature that is largely influenced by the level of oxidation of the tea leaf itself. For example, a black tea is fully oxidised, an oolong is partially oxidised and a green tea is not oxidised at all. Tannins (which are abundant in fresh tea – very good for you but unfortunately bitter in flavour) are extracted at high temperatures. So, if you pour boiling water on a green tea, it’s going to result in an unpleasant, astringent brew. To combat this, we brew that type of tea at lower temperatures – Yunnan Green for example, should be brewed at just 70°C, whereas a black English Breakfast can take water at 95°C. In our experience, some of the most well-known afternoon tea establishments in the world are still not paying this level of attention. A chef would never send out food that was overcooked and a sommelier would never send out white wine at room temperature, so why would we serve over-steeped tea? Water quality, as well as temperature, also has a big effect on the final outcome of a tea – in terms of flavour, aroma and appearance. The water that comes out of our taps contains an abundance of different minerals including iron, calcium, potassium and sodium, as well as chlorine and even pesticides. All of these additional elements lend their own flavour to the water and can also have an effect on how the flavour compounds in the tea dissolve. For example, a very hard water can result in a very flat, cloudy tea. What a filter does is alter the balance of the water by removing some of those unwanted additional elements. This results in customers tasting the pure flavour of the teas, untainted by the flavour of tap water. 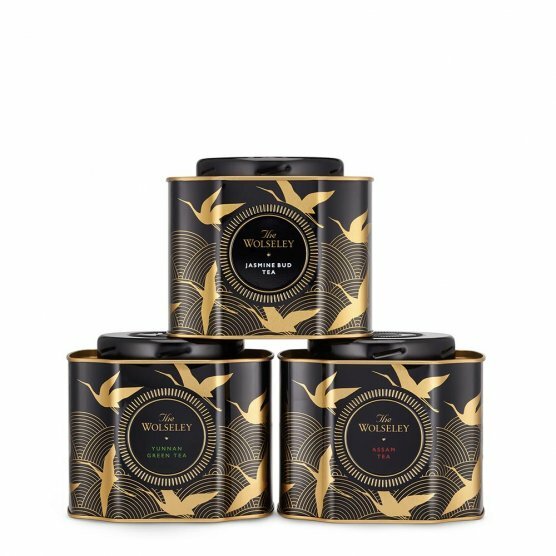 All of The Wolseley’s teas are meticulously stored in airtight containers. If tea is left exposed to the air, the aroma compounds within it will degrade quicker and/or escape, resulting in a dull, stale flavour. Conversely, if tea is exposed to other aromas it will absorb them – for example if a Yunnan Green is stored next to a Lapsang Souchong, it might end up tasting smoky. It sounds obvious, but an important step in the tea-brewing process is measuring the exact quantity of leaves to ensure the correct ratio of tea to water. The team at The Wolseley are trained to know exactly this. Last but not least, every member of The Wolseley’s Front of House & Barista teams have been personally educated in the art of brewing the perfect cup of tea. They have learnt the history and science of tea, they know the origin of each and every one of the teas that have been sourced directly from small family-run farms and they have tasted each tea along with learning their flavour profile so they can recommend pairings with food. In a nutshell, they are armed to serve beautiful tea in the restaurant to the highest possible standard each and every time.